The rise in popularity of obstacle type races (like mud runs) has paved the way for other out of the ordinary running series in recent years, and none have made a bigger splash than the Color Run. Unlike obstacle races, or traditional running for that matter, the Color Run isn’t about pushing the physical and mental limits of your body. Rather, it’s about bringing people together—people who otherwise wouldn’t find themselves signed up for a 3+ mile race—and celebrating “healthiness, happiness and individuality.” Think of it as a block party that spans the length of five kilometers—one where you get doused in a vibrant array of colors as you make your way from the start to the finish. 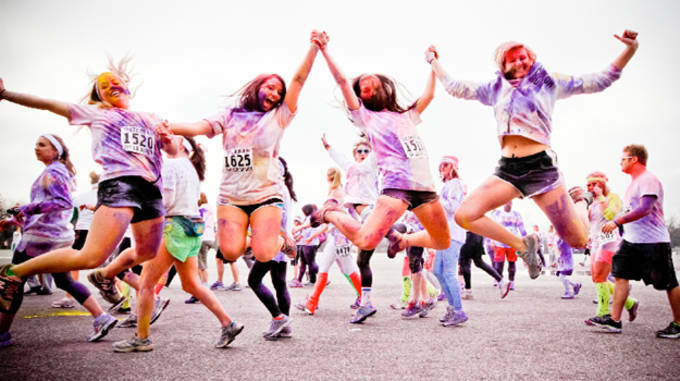 Now that the question of “WTF is a Color Run?” has been answered, here are 10 things to know about America’s “happiest” race series. Gurvinder Singh Gandu is a New York City-based writer and wear-tester for Sneaker Report, and contributor to Complex Media. Follow him on Twitter @GurvinderSG for the latest in performance footwear and gear. What began as a local race with a mere 6,000 participants has quickly exploded into a series that has raked in over a million participants in 2013. Did we mention it was started just a year ago? 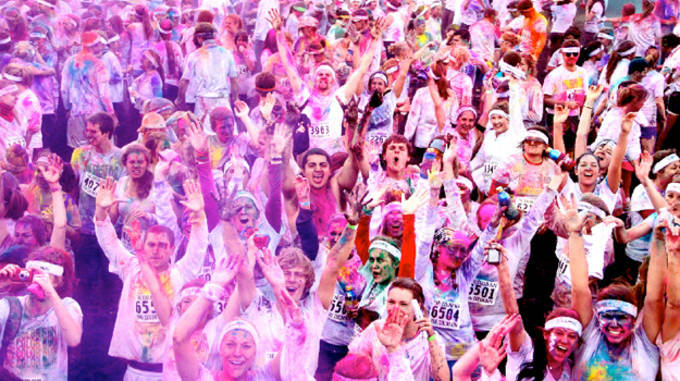 Today, the Color Run is ranked as the most popular 5k running series in the states. And it&apos;s on track to take over the world. 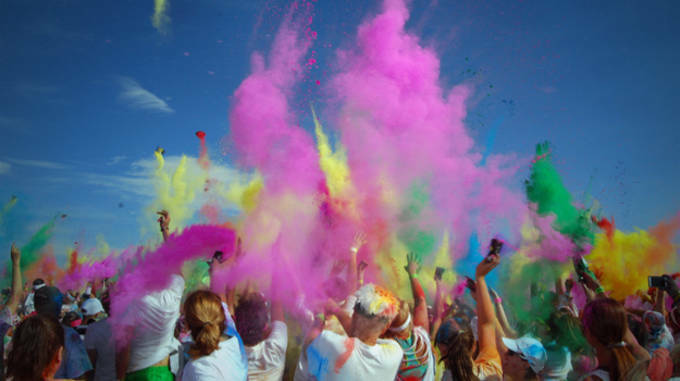 Since the maiden Color Run that took place in January 2012 in Phoenix, Arizona, the event has grown to over 100+ cities around the U.S., and many more overseas. 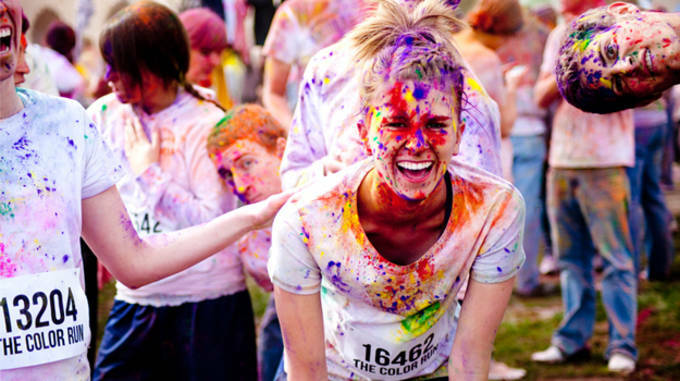 The Color Run is five kilometers of color filled chaos. In case you’re wondering, that equates to 3.1 miles of running. 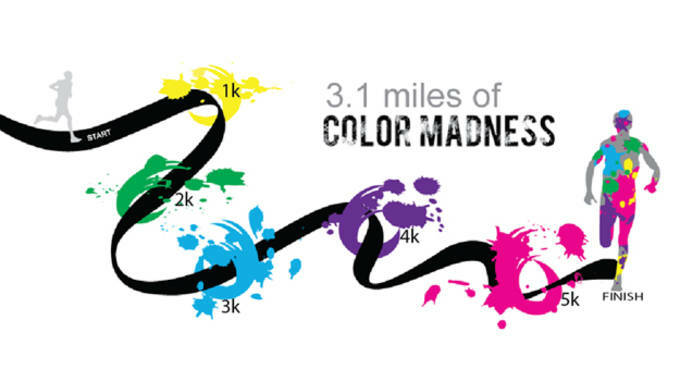 Not a marathon by any means, but certainly long enough to make sure you break a colorful sweat. 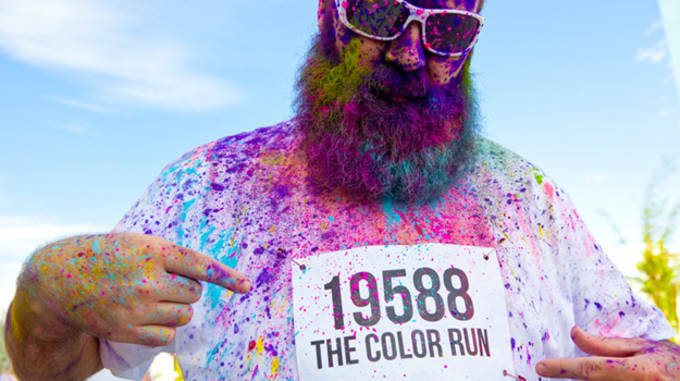 Look, no one signs up for a Color Run in hopes of setting a PR. Rather, it’s more about having a good time than finishing first. Just go out there and enjoy yourself. Hell, the event isn’t even timed, so don’t sweat it. The whole point of the race is to come out looking like a Jackson Pollock painting. 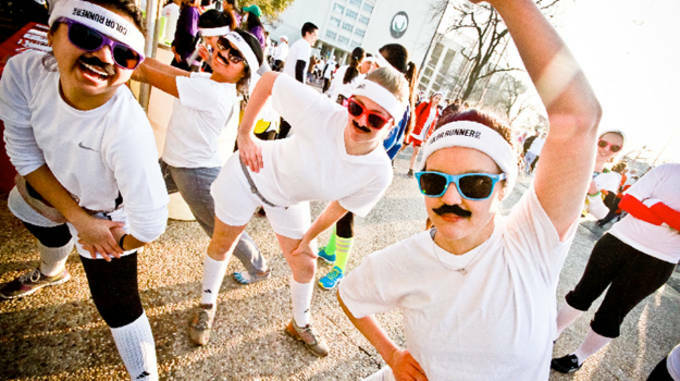 There’s no strict dress code policy, but for optimal results, it’s suggested you hit the starting line clad in all-white attire. So basically, just throw on that white tee buried in your dresser and call it a day. No, there’s no problem with flying solo dolo, but you will certainly have a more enjoyable experience if you roll in numbers—so round up the crew. A team must include a minimum of four participants (there’s no max). It’s not a relay format. Instead, the point is to run as a group and take it all in. 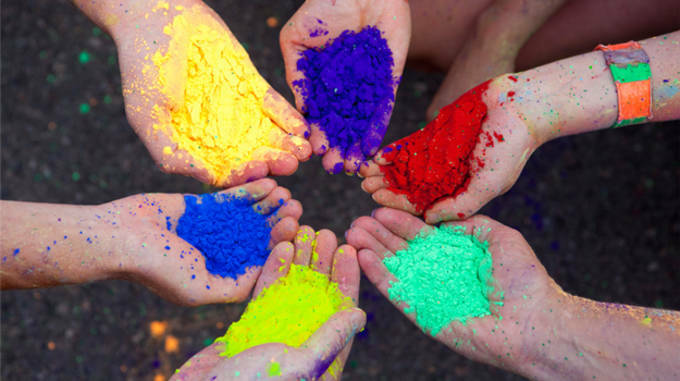 The colored powder used is made from food grade cornstarch and is 100% natural, so it’s apparently safe. Don’t worry, there aren’t any paintball guns involved. Still, you’ll want to do your best to shield your eyes, nose, and mouth from the flying power. Try a pair of sunglasses or a bandana. As with any genius idea, imitators have popped up since the Color Run first kicked off the multicolored craze last year. 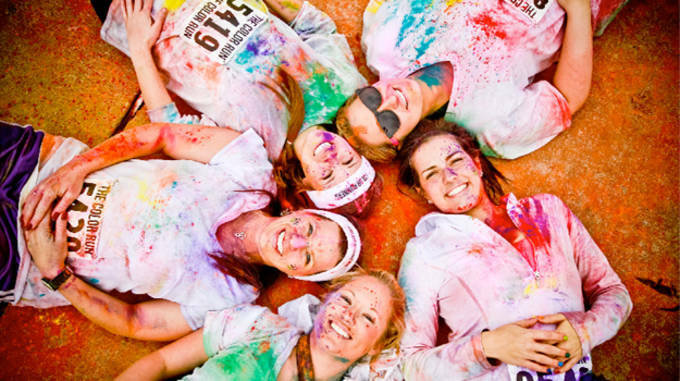 Other popular color-themed 5k’s include Color Me Rad, Color In Motion, and Color Vibe, to name a few. 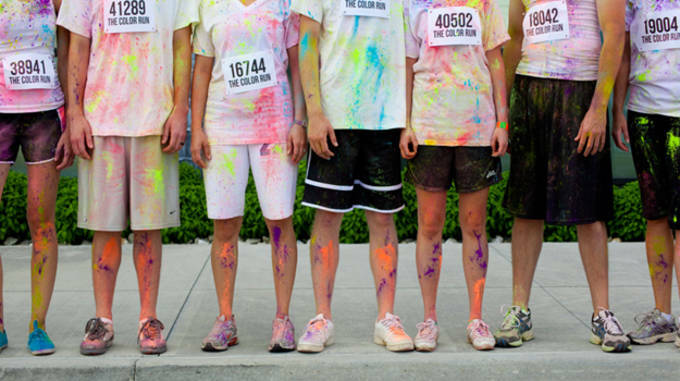 Do not go out and buy a new pair of running shoes for the Color Run—don’t do it! The shoes you have now should be able to handle a 5k (or at least we hope so). Wear sneakers that you won’t mind parting with, because you will get a full-body paint job by the time it’s all said and done. So here’s the deal—you get your own personal bag of color in your race bag (which you’ll pick up prior to the race). While it will be more than tempting to chuck it at someone as soon as the gun goes off, you’ll want some ammo at the end of the race. Besides, there will be plenty of color flying around during the race. If you’ve got money to blow, there are addition bags of color for sale at the finish line, so have at it. 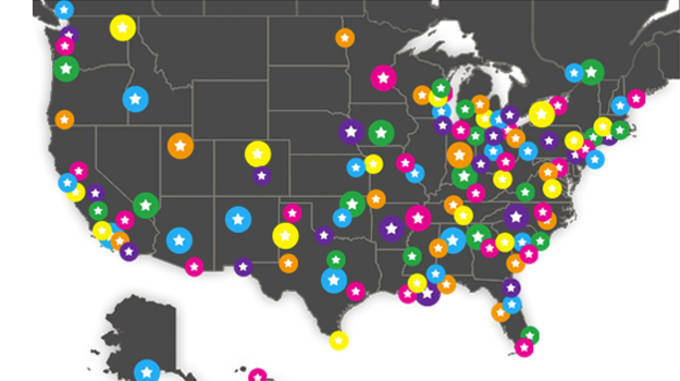 Check out The Color Run for a complete listing of races in your area.